Russian engineers have developed a system to track fake diamonds. The new solution is based on the technology of the distributed registry, which should prevent the spread of fakes in the market. The new Russian system will help trace the diamond’s origin and its further life through its stages including mining and cutting. The system will also keep track of who owns the stone at the moment. The blockchain solution was developed by the company Bitcarat.com, founded by graduates of two respected Russian technical schools, NUST MISIS and MPEI. Even at the extraction stage, the system is to assign each gem a unique digital code, which is then entered into the blockchain base. As a result, information about the entry will be simultaneously stored with all market participants who will also have access to the system. Each operation with the diamond, including the transfer of ownership, will be recorded in the blockchain. With synthetic and even fake gemstones becoming increasingly common on the market, such a system can become a guarantor of the authenticity of diamonds. 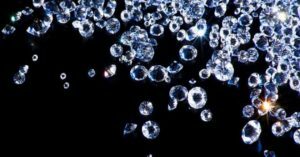 In the fall of 2018, Russian diamond mining company Alrosa said it was testing the Tracr blockchain system for tracking diamonds; the developer of the solution was De Beers Corporation.